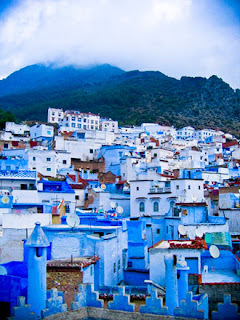 Being on a mountain with shades of blue and white make Chefchaouen, Morocco, looks pretty and cool. Not to mention its location on top of the mountain adds to the perfection of nature in North Africa. When comes to this town, certainly the whole traveler was amazed at the beauty of this city. 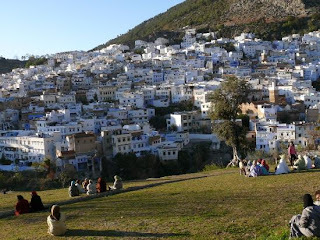 The town is located in northeastern Morocco does look very cool and comfortable. This city has always been a favorite place for tourists. Nearly every Moroccan cliché embodiment here. Beautiful layout with the background adds to the perfection of dramatic mountainous Rif whitewashed houses with blue accents. Besides it's beauty, tourism Chaouen also helped by the city's reputation as a center for marijuana plantations are located in northern Morocco. Somehow, this plant legalized. However, not as easy as tourists back your hand to get marijuana in the city. Because the sellers of marijuana in this place could squeeze the tourists. Besides enjoying the air and the beauty of the city that have shaped the path alleys, visitors can climb into the Rif mountains. The city became the starting point of the climb is very fitting. Of course, if you want to do this trip must request permission in advance by the city government. It is also intended to maintain the security of the climbers. People in the city which is also commonly called Chaouen are friendly to newcomers. If there are tourists who need help or assistance, they will always help. In the midst of the bright, blue sky that filled every corner of the city into a beautiful panoramic camera shots for each of the tourists. Yes, it is a lot of tourism potential travelers can find in here. Want to see this city from an angle that is perfect? You can visit the Hotel Atlas. Yes, this is the best point to see the best natural panorama Chaouen. It was white and blue landscape of this city to make tourists as if the sky is very quiet. Although, sometimes magical nuances of each of the doors and hallways are always accompanied the city's tourist trip.